This time of year apple recipes are everywhere—pies, cakes, breads, pastries, butters, and drinks! You can find apple cider at your local grocery store and fresh from the farm. Bars are changing the taps to include hard apple ciders that make for an interesting alternative to your favorite brew. This time of year apple recipes are everywhere—pies, cakes, breads, pastries, butters, and drinks! You can find apple cider at your local grocery store and fresh from the farm. Bars are changing the taps to include hard apple ciders that make for an interesting alternative to your favorite brew. If you’re looking for a delicious drink that’s the perfect compromise between the tangy pour at the bar and the sweet sip from the store-bought jug, this recipe for Spiced (and Spiked!) 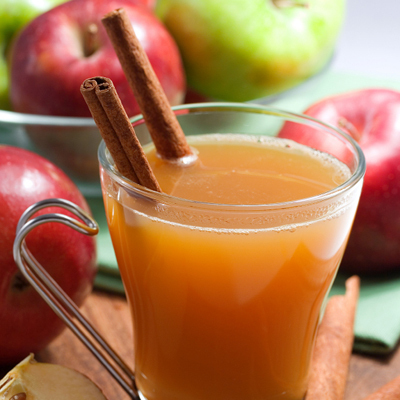 Apple Cider will hit the spot. You’ll be happy to notice some of the same ingredients that make your baked apple treats so tasty (cloves, nutmeg, cinnamon sticks), are also a part of this cozy drink. That’s how you know it’s going to be good, right?! Apple brandy is what gives this sip its spike, but just nix it if you're hosting a big party with an underage or non-drinking crowd.